Researchers from the Universities of Bonn and Mainz have discovered a mechanism that seems to protect the brain from aging. 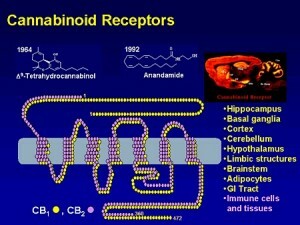 In experiments with mice, they switched off the cannabinoid-1 receptor. As a consequence, the animals showed signs of degeneration as seen in people with dementia much faster. The research results are presented in a current issue of the Proceedings of the National Academy of Sciences (PNAS). Humans are getting older and older, and the number of people with dementia is increasing. The factors controlling degeneration of the brain are still mostly unknown. However, researchers assume that factors such as stress, accumulation of toxic waste products as well as inflammation accelerate aging. But, vice versa, there are also mechanisms that can - like a bodyguard - protect the brain from degenerating, or repair defective structures. Researchers from the Universities of Bonn and Mainz have now discovered a hitherto unknown function of the cannabinoid-1 receptor (CB1). A receptor is a protein that can bind to other substances, triggering a chain of signals. Cannabinoids such as THC - the active agent in cannabis sativa - and endocannabinoids formed by the body bind to the CB1 receptors. The existence of this receptor is also the reason for the intoxicating effect of hashish and marijuana. Not only does the CB1 receptor have an addictive potential, but it also plays a role in the degeneration of the brain. "If we switch off the receptor using gene technology, mouse brains age much faster," said Onder Albayram, principal author of the publication and a doctoral student on the team of Professor Dr. Andreas Zimmer from the Institut für Molekulare Psychiatrie at the University of Bonn. "This means that the CB1 signal system has a protective effect for nerve cells." The researchers studied mice in different age categories young six week old animals, middle-aged ones at five months, and those of an advanced age at 12 months. The animals had to master various tasks first, they had to find a submerged platform in the pool. Once the mice knew its location, the platform was moved, and the animals had to find it again. This was how the researchers tested how well the rodents learned and remembered. The animals in which the CB1 receptor had been switched off (the knock-out mice) clearly differed from their kind. "The knock-out mice showed clearly diminished learning and memory capacity," said Privatdozent Dr. Andras Bilkei-Gorzo from Professor Zimmer's team, who led the study. So, animals that did not have the receptor were less successful in their search for the platform. "In addition, they showed a clear loss of nerve cells in the hippocampus," he explained further. This part of the brain is the central area for forming and storing information. In addition, the researchers found inflammation processes in the brain. As the mice advanced in age, the degenerative processes became increasingly noticeable. The animals with the intact CB1 receptor, to the contrary, did clearly better with regard to their learning and memory capabilities, as well as the health of their nerve cells. "The root cause of aging is one of the secrets of life," commented Albayram. This study has begun to open the door to solving this enigma. The processes in the mouse brains have a surprising number of parallels with age-related changes in human brains. So, the endocannabinoid system may also present a protective mechanism in the aging of the human brain. The principal author cautioned, "This will require additional research." The scientists would like to better understand the mechanism by which CB1 receptors protect the brain from inflammation processes. And based on these signal chains, it might then be possible to develop substances for new therapies. Source: Universität Bonn, AlphaGalileo Foundation.